The euro today was on a recovery path following yesterday’s “flash crash” that was triggered by Apple’s profit warning based on the economic slowdown in China. The EUR/USD was also under pressure due to the decline in German bond yields and the placing into administration of an Italian bank by the ECB. The EUR/USD currency pair today rallied from an opening low of 1.1308 to a high of 1.1384 in the European session. The currency pair was one of the least affected by yesterday’s “flash crash” that affected most Asian currencies and other riskier currencies. The euro was further weighed down by the European Central Bank‘s decision to place Italy’s Carige Bank under administration after many of the bank’s top executives resigned. 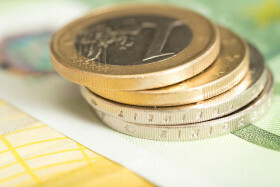 The bank has been facing problems after shareholders recently failed to approve its latest plan to raise €400 million. This move is evidence that the financial system in Italy is facing significant risks given the large burden of non-performing loans held by most banks. The currency pair’s recovery stalled at a crucial resistance level and analysts are waiting to see where it will head later. The euro is also looking to the German bond yields for direction given that they were depressed during yesterday’s session. The currency pair’s short-term performance is likely to be affected by the release of the US ADP employment data and the ISM manufacturing data later today. The EUR/USD currency pair was trading at 1.1355 as at 11:22 GMT having dropped from a high of 1.1384. The EUR/JPY currency pair was trading at 122.18 having recovered from a low of 121.30.